Why wait until spring to enjoy your garden? Despite the atypical weather of recent weeks, Seattle’s mild climate lends itself to gardens that bring pleasure year-round. Adding winter interest to your Pacific Northwest landscape offers big rewards during winter’s darkest days. Careful plant selection is key to a fabulous garden in winter. Look for plants that captivate long before the first daffodils emerge in early spring. Texture, fragrance, form, flowers, color, and fruit are some of the attention-grabbing features that enhance a winter landscape. Hybrid mahonias (such as Mahonia x media ‘Winter Sun’) offer sprays of fragrant, yellow flowers adored by humans and hummingbirds alike. Their exoticism is aided by their large, stiff, frond-like leaves. From early fall through December, the earthy-scented white flowers of Camellia sasanqua ‘Setsugekka’ are framed by its dark evergreen foliage. This loosely branching shrub can be espaliered against a wall or woven through the landscape below larger trees and shrubs. Daphne bholua ‘Jacqueline Postill’ has an attractive narrow form, elegant evergreen foliage, and hundreds of sweetly scented flowers in the depths of winter. The queen of the winter garden has to be the Witch Hazel. Its many varieties vary in size and form, along with the color and scent of its spidery winter flowers—you cannot go wrong by selecting this star performer! Deciduous trees, leafless in winter, can create interest with their extraordinary bark. 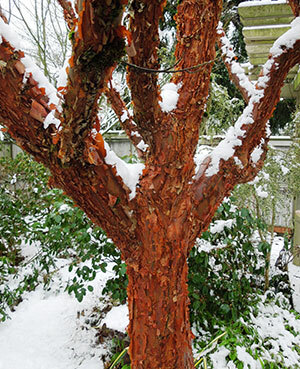 Among them are Paperbark Maple and Orangebark Stewartia, which have flaking, cinnamon-colored bark, and Japanese Stewartia, with its patchwork of pink, red-brown, and gray along the trunk and branches, in addition to an elegant architecture. 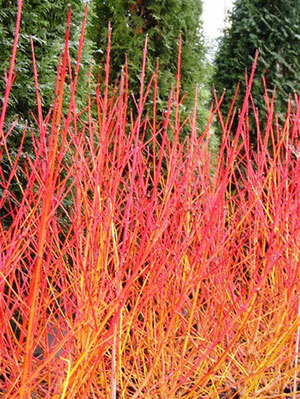 Blazingly colorful stems can be found on twig dogwoods. Cornus sanguinea ‘Midwinter Fire’ surrounded by Black Mondo Grass is a winning combo. Among numerous other intriguing choices for the winter landscape are Harry Lauder’s Walking Stick for its contorted form, Garrya x issaquahensis for its long silky catkins, and Calluna vulgaris ‘Firefly’ for its fiery red foliage. And don’t overlook plants with golden or variegated evergreen foliage—they can really brighten up a dark area. Be sure to incorporate conifers into your winter landscape. These mostly evergreen plants offer infinite variations in size, form, texture, color, and cones. 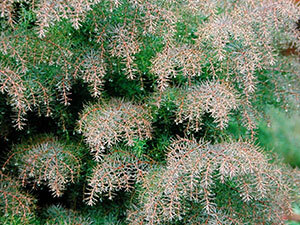 The soft green needles of Cryptomeria japonica ‘Elegans’ become mahogany plum in late autumn and winter. And the dark green mass of our native Incense Cedar provides a lush background against which to showcase your winter plant treasures. 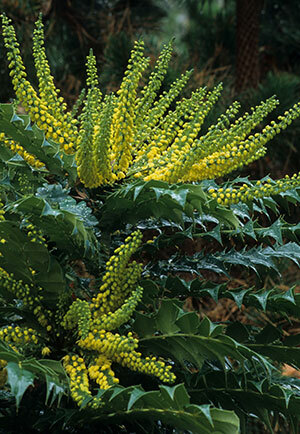 Evergreen ferns and winter-flowering groundcovers will help complete the garden scene. Providing food, shelter, water, and nest material to birds during winter will help our feathered friends while also enriching our own lives. Water that doesn’t freeze, seedheads and fruit for foraging, and evergreen groundcovers for shelter and protection from marauding felines will go a long way to sustain bird populations in urban environments while making your garden more than just a garden. 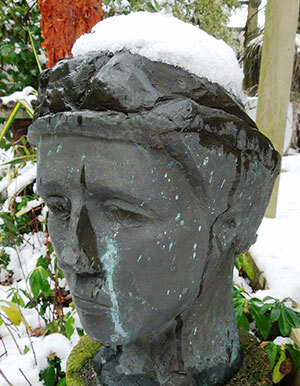 Introduce elements other than plants to brighten your winter landscape. Sculptures, fountains, and vessels are some of the items that draw the eye away from the bleak and toward the unique. Last but not least, identify an outdoor area where you can savor what you’ve created while soaking up the low winter sun. There are always a few days in mid and late winter when the sun is blazing and it’s just warm enough to sit outside. A low bench built against a south-facing wall is ideal. What could be more heavenly than watching hummingbirds flit among mahonia blossoms while relaxing in the warmth of the winter sun? Consider hiring a landscape professional to help create a winter paradise in your own backyard. Landscape designers have hundreds of ideas—ideas tailored to your personal needs, interests, and site. Ask your landscape designer to help you create a garden with winter interest and you are guaranteed to have a garden that thrills 365 days of the year!